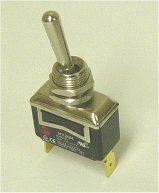 We have power toggle & miniature toggle switches for different applications, including appliances, office equipment, IT and telecommunication, lighting, power tools, industrial controls. Popular consumer products include blender, coffee maker and power tools. We also can cross other manufacturer's part numbers, including C&K, APEM, Carling, Marquardt, McGill, NKK, EATON, Arcolectric. Phone: 503 - 564 4647 | sales@phaseda.com Copyright (c) 2008 Phaseda LLC. All rights reserved.